Serge Prokofieff: Symphony #1, "Classical"
This two-CD set is a fine tribute to the much underrated Romanian conductor and composer Constantin Silvestri (1913-1969) whose recordings always manage to elicit a thrilling enthusiasm. I recall first hearing his magnificent conducting on an EMI Eminence LP featuring Tchaikovsky's 1812 Overture which fairly used to leap out of the speakers. 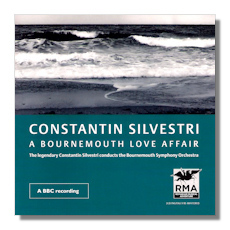 The recordings of major importance here are the live recordings of the Enescu symphony and the orchestra suites which demonstrate Silvestri's innate knowledge of his compatriot's repertoire. However the sound is rather dull and the lithe playing of the Bournemouth Symphony is somewhat obscured although these are still probably the best recordings of the works concerned. Silvestri was also a dab hand at composers such as Mozart and Prokofiev as the performances here attest although I was rather disappointed by his own work which lacks cohesion and is rhythmically all over the place. However this is a fine collection of recordings which definitely deserves wider currency and circulation.